Seasonal average vertical columns of tropospheric ozone in Dobson units over the period 1979 to 2000. In June to August photochemical ozone production causes very high concentrations over the East Coast of the USA and China. Ozone (O3) is a trace gas of the troposphere, with an average concentration of 20-30 parts per billion by volume (ppbv), with close to 100 ppbv in polluted areas. Ozone is also an important constituent of the stratosphere, where the ozone layer exists. The troposphere is the lowest layer of the Earth's atmosphere. It extends from the ground up to a variable height of approximately 14 kilometers above sea level. Ozone is least concentrated in the ground layer (or planetary boundary layer) of the troposphere. It's concentration increases as height above sea level increases, with a maximum concentration at the tropopause. About 90% of total ozone in the atmosphere is in the stratosphere, and 10% is in the troposphere. Although tropospheric ozone is less concentrated than stratospheric ozone, it is of concern because of its health effects. Ozone in the troposphere is considered a greenhouse gas, and may contribute to global warming. Photo-chemical and chemical reactions involving ozone drive many of the chemical processes that occur in the troposphere by day and by night. At abnormally high concentrations (the largest source being emissions from combustion of fossil fuels), it is a pollutant, and a constituent of smog. Photolysis of ozone occurs at wavelengths below approximately 310-320 nano-meters. This reaction initiates the chain of chemical reactions that remove carbon monoxide, methane, and other hydrocarbons from the atmosphere via oxidation. Therefore, the concentration of tropospheric ozone affects how long these compounds remain in the air. If the oxidation of carbon monoxide or methane occur in the presence of nitrogen monoxide (NO), this chain of reactions has a net product of ozone added to the system. Ozone in the atmosphere can be measured by remote sensing technology, or by in-situ monitoring technology. Because ozone absorbs light in the UV spectrum, the most common way to measure ozone is to measure how much of this light spectrum is absorbed in the atmosphere. Because the stratosphere has higher ozone concentration than the troposphere, it is important for remote sensing instruments to be able to determine altitude along with the concentration measurements. The TOMS-EP instrument aboard a satellite from NASA is an example of an ozone layer measuring satellite, and TES is an example of an ozone measuring satellite that is specifically for the troposphere. Lidar is a common ground based remote sensing technique to measure ozone. TOLnet is the network of ozone observing lidars across the United States. Ozonesondes are a form of in situ, or local measurements. An ozonesonde is an ozone measuring instrument attached to a meteorological balloon, so that the instrument can directly measure ozone concentration at the varying altitudes along the balloon's upward path. The information collected from the instrument attached to the balloon is transmitted back using radiosonde technology. NOAA has worked to create a global network of tropospheric ozone measurements using ozonesondes. 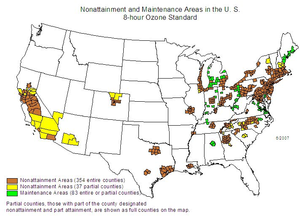 Ozone is also measured in air quality environmental monitoring networks. In these networks, in-situ ozone monitors based on ozone's UV-absorption properties are used to measure ppb-levels in ambient air. The majority of tropospheric ozone formation occurs when nitrogen oxides (NOx), carbon monoxide (CO) and volatile organic compounds (VOCs), react in the atmosphere in the presence of sunlight, specifically the UV spectrum. NOx, CO, and VOCs are considered ozone precursors. Motor vehicle exhaust, industrial emissions, and chemical solvents are the major anthropogenic sources of these ozone precursors. Although the ozone precursors often originate in urban areas, winds can carry NOx hundreds of kilometers, causing ozone formation to occur in less populated regions as well. The chemical reactions that produce tropospheric ozone are a series of interrelated cycles (known as the HOx and NOx cycles); They start with the oxidation of carbon monoxide (CO) or VOCs (such as butane). To begin the process, CO and VOCs are oxidized by the hydroxyl radical (•OH) to form carbon dioxide (CO2), and water (H2O) in the CO oxidation case. These oxidizing reactions then produce the peroxy radical (HO2•) that will react with NO to produce NO2. NO2 is subsequently photolyzed during by daytime, thus resulting in NO and a single oxygen atom. This single oxygen atom reacts with molecular oxygen O2 to produce ozone. Peroxy-radicals then go on to react with NO to produce NO2, which is photolysed by UV-A radiation to give a ground-state atomic oxygen, which then reacts with molecular oxygen to form ozone. note that these three reactions are what forms the ozone molecule, and will occur the same way in the oxidation of CO or VOCs case. Inflammation and damage to the lining of the lungs. Within a few days, the damaged cells are shed and replaced much like the skin peels after a sunburn. Animal studies suggest that if this type of inflammation happens repeatedly over a long time period (months, years, a lifetime), lung tissue may become permanently scarred, resulting in permanent loss of lung function and a lower quality of life. The United States Environmental Protection Agency has developed an Air Quality index to help explain air pollution levels to the general public. 8-hour average ozone mole fractions of 76 to 95 nmol/mol are described as "Unhealthy for Sensitive Groups", 96 nmol/mol to 115 nmol/mol as "unhealthy" and 116 nmol/mol to 404 nmol/mol as "very unhealthy" . The EPA has designated over 300 counties of the United States, clustered around the most heavily populated areas (especially in California and the Northeast), as failing to comply with the National Ambient Air Quality Standards. Melting of sea ice releases molecular chlorine, which reacts with UV radiation to produce chlorine radicals. Because chlorine radicals are highly reactive, they can expedite the degradation of methane and tropospheric ozone and the oxidation of mercury to more toxic forms. Ozone production rises during heat waves, because plants absorb less ozone. It is estimated that curtailed ozone absorption by plants is responsible for the loss of 460 lives in the UK in the hot summer of 2006. A similar investigation to assess the joint effects of ozone and heat during the European heat waves in 2003, concluded that these appear to be additive. ^ a b c d Warneck, Peter (1999). Chemistry of The Natural Atmosphere. Academic Press. ISBN 9780080529066. ^ a b c "8.2 Tropospheric ozone". elte.prompt.hu. Retrieved 2018-11-12. ^ a b "Nasa Ozone Watch: Ozone facts". ozonewatch.gsfc.nasa.gov. Retrieved 2018-11-12. ^ a b c d e f "Ozone in the Troposphere | UCAR Center for Science Education". scied.ucar.edu. Retrieved 2018-11-12. ^ a b "Tropospheric ozone | Climate & Clean Air Coalition". ccacoalition.org. Retrieved 2018-11-12. ^ Taniguchi, Nori; Takahashi, Kenshi; Matsumi, Yutaka (2000). "Photodissociation of O3around 309 nm". The Journal of Physical Chemistry A. 104 (39): 8936–8944. doi:10.1021/jp001706i. ISSN 1089-5639. ^ a b c Reeves, Claire E.; Penkett, Stuart A.; Bauguitte, Stephane; Law, Kathy S.; Evans, Mathew J.; Bandy, Brian J.; Monks, Paul S.; Edwards, Gavin D.; Phillips, Gavin (2002-12-11). 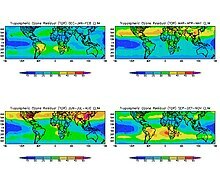 "Potential for photochemical ozone formation in the troposphere over the North Atlantic as derived from aircraft observations during ACSOE". Journal of Geophysical Research: Atmospheres. 107 (D23): ACH 14–1–ACH 14–14. doi:10.1029/2002jd002415. ISSN 0148-0227. ^ a b ERSL NOAA. "How is ozone measured in the atmosphere?" (PDF). /www.esrl.noaa.gov/. ^ "Measuring ozone from space". Retrieved 2018-11-12. ^ NASA. "TES". tes.jpl.nasa.gov. Retrieved 2018-11-12. ^ LaRC, Ali Aknan (2005-06-22). "NASA Tropospheric Chemistry Integrated Data Center". www-air.larc.nasa.gov. Retrieved 2018-11-12. ^ Laboratory, US Department of Commerce, NOAA, Earth System Research. "ESRL Global Monitoring Division - Ozone and Water Vapor Group". www.esrl.noaa.gov. Retrieved 2018-11-12. ^ Jin Liao; et al. (January 2014). "High levels of molecular chlorine in the Arctic atmosphere". Nature Geoscience. 7 (2): 91–94. Bibcode:2014NatGe...7...91L. doi:10.1038/ngeo2046. ^ "It's not just the heat – it's the ozone: Study highlights hidden dangers". University of York. Retrieved January 14, 2014. Amann, Markus (2008). Health Risks of Ozone from Long-range Transboundary Air Pollution. WHO Regional Office Europe. ISBN 978-92-890-4289-5. Bell, M. L.; McDermott, A.; Zeger, S. L.; Samet, J. M.; Dominici, F. (2004). "Ozone and Short-term Mortality in 95 US Urban Communities, 1987–2000". JAMA: The Journal of the American Medical Association. 292 (19): 2372–8. doi:10.1001/jama.292.19.2372. PMC 3546819. PMID 15547165. Seinfeld, John H.; Pandis, Spyros N. (2016). Atmospheric Chemistry and Physics: From Air Pollution to Climate Change (3rd ed.). Wiley. ISBN 978-1-119-22116-6. Wayne, Richard P (2000). Chemistry of Atmospheres (3rd ed.). Oxford University Press. ISBN 978-0-19-850375-0.
Cooper, O.R. ; Parrish, D.D. ; et al. (2014). "Global distribution and trends of tropospheric ozone: An observation-based review". Elementa: Science of the Anthropene. 2: 29. doi:10.12952/journal.elementa.000029.